As part of the regional 2016-2021 Comprehensive Economic Development Strategy and the South Central Minnesota Climate Change Vulnerability Assessment and Adaptation planning processes, Region Nine Development Commission has identified some key challenges the region will face related to climate change and the aging workforce. Agriculture as a sector is not immune to these challenges. The South Central MN Agriculture Resilience Plan will compile strategies to help mitigate these challenges and increase resilience in the regional economy. Resilience is south central Minnesota’s ability to respond to disasters today as well as preparing systems that require limited response to such disasters in the future. By planning for these two aspects of resilience, Region Nine will help create a broad view of agriculture that defines its role in achieving the economic and quality of life goals identified by the region. First, Region Nine will conduct a survey analysis of existing stakeholders in agriculture and agri-business in south central Minnesota, including major producers and processors as well as smaller growers. 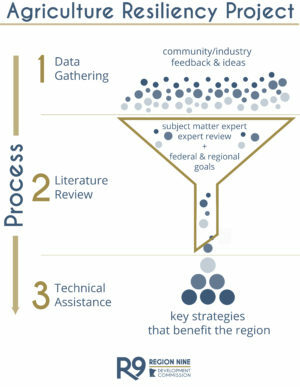 Second, Region Nine will conduct a comprehensive literature review of community and agriculture best practices with intentional emphasis on strategies that align agriculture with goals established in the 2016-2021 Comprehensive Economic Development Strategy and the South Central Minnesota Climate Change Vulnerability Assessment and Adaptation Plan. Third, Region Nine will conduct a series of technical assistance sessions. These will build upon the analysis with Region Nine facilitating focused dialogues between identified best management professionals and private agricultural enterprises. This ensures that implementers are as prepared and supported as they can be as a result of working with Region Nine throughout this planning process. Due to the unique nature of agriculture’s intimate relationship with the landscape, it is imperative that any progress in building a resilient sector that supports communities be measured in tangible, practical on the ground changes. Region Nine is currently preparing a South Central Agriculture Resilience Plan. The plan will compile insights from stakeholders across the region and help prepare decision makers to address challenges in agriculture and increase resilience in the local economy. At the conclusion of the project, Region Nine will work to bring expert workshops into the region to address the issues revealed during this outreach process.